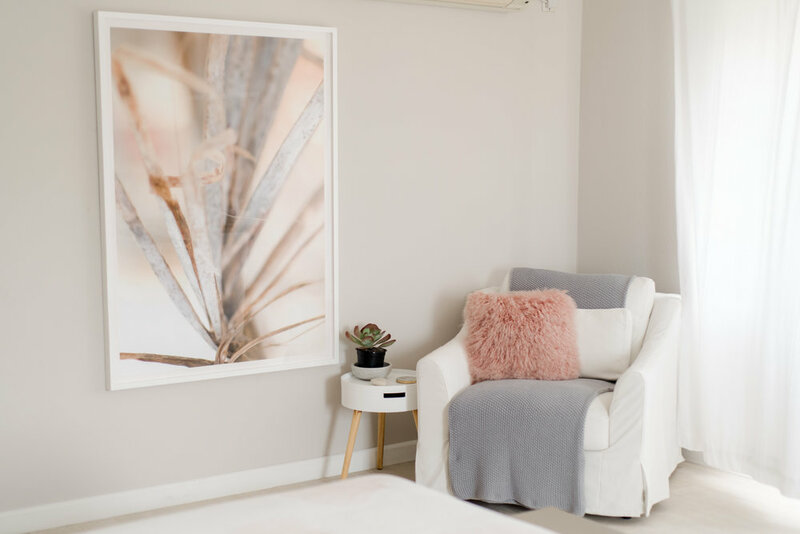 following along from my last post which featured this dreamy bedroom designed by l'atalier de sophie, i was reminded of the above quote when sophie posted about the room on insta, she mentioned how the soft pink and grey hues inspired her. i struggle at times to share my art, to be vulnerable, but this was a reminder that if you don't share what you love, you will not inspire others. i love the soft colours, the creamy tones. tropical images are not always about bright, primary colours and sharp, contrasting light. and i love art to be displayed in a large scale. i was really pleased at the quality produced by colour xl. their matte finish really suits my style of photography and keeps the creaminess of the image. i hope the image brings a calm, breezy feel to room and continues to inspire. you can see more island inspired imagery in my store. if you are interested in printing any images you can message me directly.